With their days numbered thanks to the publisher-wide relaunch that arrives later this summer, one could easily come to the conclusion that the air's been let out of many of DC's upper-tier books. And I'd love to tell you differently, that the creative teams in question are using the impending shake-up as motivation to tell the stories they've always wanted to tell, not a death sentence looming directly overhead, but this month's issue of Superman serves as no such proof. J. Michael Straczynski's storyline this month feels like a limp-wristed placeholder without any purpose beyond keeping the racks supplied with a fresh cover. It's as run of the mill as they come, almost insulting in its reluctance to move forward with any sense of purpose or revelation. Worse, it retrofits recent storylines to fit a cheap, cop-out of a payoff with neither rhyme nor reason. This month's issue has Superman at his preachy worst, bleeding heart in one hand and random Kryptonian plot device in the other. It's one retreaded flashback after another, serving no significant purpose beyond reminding the readers once again of where the character has been and giving Supes a reason to don a goofy, ill-timed grin in the middle of a brawl. It's a series of narrative thought bubbles spoken aloud to no one in particular. It's every bad stereotype I've come to associate with the character, but always hoped could be disproven. It's a rotten waste of time issue, and I can't just relegate that criticism to the storytelling. Jamal Igle makes for a spectacular background artist, but his foreground work could do with a major overhaul. Under Igle's watch, Superman himself moves clumsily, wears a series of odd, over-rendered facial expressions, and looks like a genuinely dated character out-of-place with modern society. Accompanied by Marcelo Maiolo's harsh, drastic color choices, though, his efforts seem even worse. Amidst an excess of contrast and a reckless amount of detail, this month's visuals are difficult to decipher at best and downright ugly at worst. It's the tag team from hell, and they're double-teaming your eyeballs behind the referee's back. 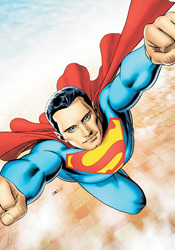 Naturally, a bad plot, terrible script, overwrought pencils and overbearing colors don't often come together to produce a worthwhile finished product, and in that regard Superman #714 performs no miracles. It's a burden of an issue, traumatic to the bitter end, and something I wouldn't loan to my worst enemies for fear of how far they'd have to reach to seek true retribution. An abysmal failure of a comic book, it proves that in some instances the great DC renumbering is something of a mercy kill. Skip it.